Many years back (in early 2002) I purchased my previous truck. The one before that was a 1999 model, on a 3 year lease. The 2002 truck was the first new vehicle I had owned. At the time, I liked it (it was a Ford Ranger, 4×4, XLT supercab model). Sure, it had some issues right off the bat, such as the size of it. But it was small enough to be easy to park and had a good amount of power (I selected one with the 4.0L v6 engine, the largest offered). Over the years I maintained it, had repairs done, did some repairs/work on it myself and even installed air horns at one point (with a compressor and 5 gallon tank). In 2016, since I was driving down the Lowell Connector to get onto RT3 (daily) I had enough with it. The condition of that section of road was the main reason due to how messed up it was. Bumps large enough that the rear end of the truck could swing out on me if I didn’t go over them just right. Pot holes that could swallow your entire wheel. So, I started looking around to see what was available. I had already decided (some years back) that my next vehicle/truck wasn’t going to be a Ford. I wasn’t happy with how they did away with the Ranger line, and kept promising to return it (but it had yet to even after several years). I knew that it was going to be an American brand truck, which basically meant Chevy/GMC or Dodge. Well, I had read about the issues found in the Dodge trucks over different generations (and model years). I also looked at the specifications on what both companies offered. At the time of my research, same sized Dodge trucks cargo bed capacity was approximately half that of the Chevy/GMC truck in the same size level (1500). So my next stage was to start looking to see what was out there and what the pricing really was. I soon found that I didn’t want the payments associated with a brand new truck. 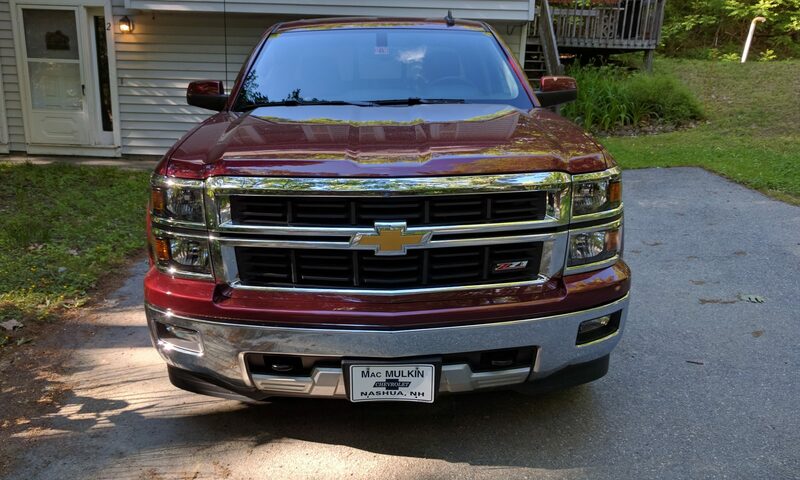 Even with the trade-in of the old truck (minus the horns and air system of course). 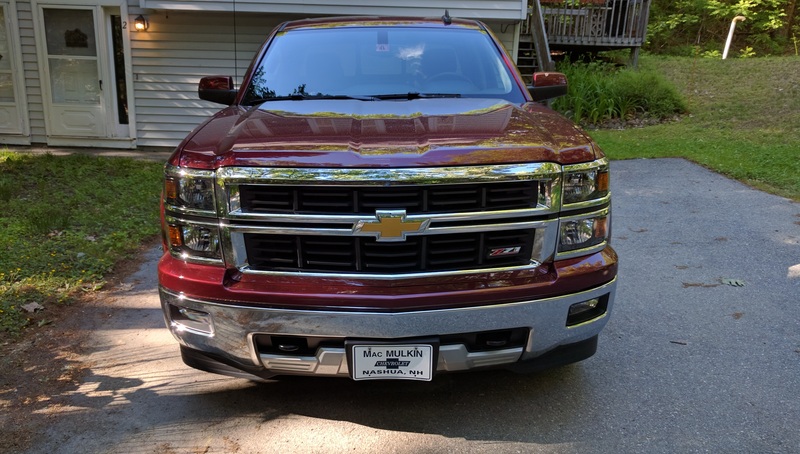 I ended up at MacMulkin Chevrolet in Nashua, NH (I was already living in Pelham at the time). The sales man took my information and saw that there were a couple of one, and two, year old models available. I looked at them, ruling out one that was a crew cab, two years old, but had the “smokers package” and I could tell people had smoked in it. That was immediately dismissed from the running. But, there was another, one year old truck on the lot. 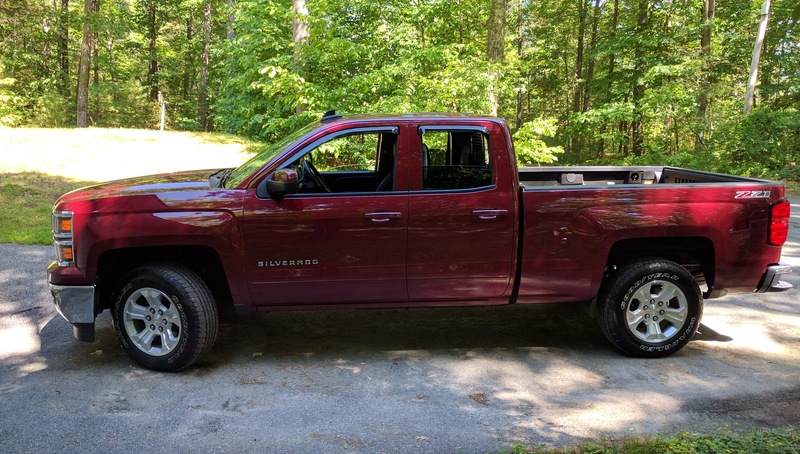 Double cab this time (that’s ok, I’m single after all), with the 5.3L v8 engine (win) 6.5′ bed, 4×4 (NOT having a truck with 4×4 in New England is just moronic), with the Z71 package (plus tow package). I do wish it came with the full navigation package, but I might be able to add that down the road a bit. We took it out for a test drive, where I let it stretch it’s legs. Yeah, the v8 was really nice. As a wise friend once told me “there’s NO replacement for displacement”. How very true. I decided to go for that truck, so my name was put on it (it was a Saturday) and we got the process rolling. I picked it up around the middle of the next week, so only a few days later, and brought it home. I’ve been enjoying it ever since. I do like how the engine will change from a v8 when you need the power, to a v4 when you don’t. I know the 2019 models will go even further with that. Ramping down to just a single piston if that’s all you need. With the v4/v8 tech in my truck I was able to get 26.4mpg on one of my day driving trips. Not bad considering it’s a 5.3L v8 engine in a 1500 series truck. Since these pictures were taken, I removed the drop-in bed liner from the truck. Mainly because the truck has the under bed rail LED lighting in it. With the bed liner in place, those lights were blocked. Using the cargo lights (includes white lights around the third brake light) it fully illuminates the entire bed (at night). In my opinion, a very worthy option. I’ve not added any step bars to this since I don’t have any trouble getting in/out when it’s parked on even moderately normal ground. Sure, some shorter people have issues getting into it, but not me. I’ve also had a undercoating applied to the frame and such during the fall of 2017. It’s something I intend to have done each year to help keep the underside of the truck in top condition. During one of the snowstorms that hit this area within the past few weeks (or month) I had to run out to get gas for the generator (lost power for about 22 hours total that time). Since there were lines, and tree branches (and even entire trees) all over the place (including the street I’m on), its a good thing I have 4 wheel drive (with options) on this truck. Once we cleared the tree branch out of the middle of the road (the plow trucks hadn’t gone down the street since it dropped, so there was at least a few inches of wet snow on the ground), I was able to get out. I used 4L to get through the snowbank at the end of the street. The front valance of the truck actually acted a bit like a ‘plow’ in this case. To the point where when I returned home (after doing further than I had thought I would need to due to several towns being without power), making the path wider, my neighbors were able to get out in their older Honda (Pilot) with it’s so-so 4 wheel drive mode. The street we’re off of was also barely plowed due to trees and parts of trees being down. A good amount of it was even reduced to a single side (so cars couldn’t go in both directions at the same time). Keeping it in 4L for that distance, also provided more than enough traction to get me to where the streets WERE cleared well. For those that care, I don’t have ‘winter’ tires on the truck. I’ve always used all terrain (or AT) tires for my trucks without any issue. They provide solid traction during all the weather we get in this region. Plus I don’t drive like a complete idiot in bad conditions. Just because you have 4 wheel drive, doesn’t mean you can go 65 up RT95 in the snow.